One of the most renowned poems written about World War One came from Lieutenant Colonel John McCrae. Titled “In Flanders Fields” it is thought the first draft of the famous piece was written during the Second Battle of Ypres. McCrae was a doctor and also served as a major and was second in command of the 1st Brigade Canadian Field Artillery. During the war, like many men, he was witness to tragic events and saw fellow troops lose their lives every day on the battlefields. On the 2nd of May 1915 one death in particular hit close to home. McCrae’s good friend, Alexis Helmer, was leaving his dugout when he was almost instantly struck and killed by a German shell. The death of Alexis was painful for John to come to terms with and while the exact details aren’t clear it is theorised he wrote the poem while grieving for his lost friend. 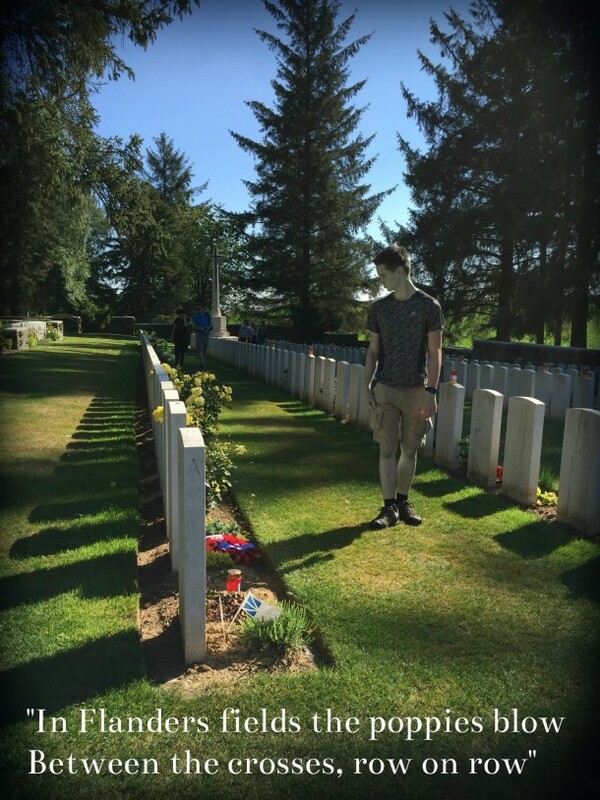 On our Battlefield Tours, we journey to Essex Farm Cemetery located in Belgium. More than 1,000 servicemen who fought during World War One are buried or commemorated here. It is also the place where John McCrae is thought to have originally written In Flanders Fields in May of 1915. Concrete bunkers exist in the middle of the memorial site that were once British Advanced Dressing stations, close to these the memorials to John McCrae and his poem can be found. The poem which can be read below highlights the careless loss of life caused by the war and McCrae’s perspective on it. In the poem, McCrae urges the reader to take the torch from the fallen soldiers as they pass the future onto us. Surprisingly, when the poem was first submitted to The Spectator in London it was rejected. However, it went on to be anonymously published in Punch Magazine in December of 1915, receiving high praise from the public. Due to the success of the poem McCrae was soon revealed to be the author. When the war ended both the poem and poppy became symbols of remembrance. John himself died while serving in 1918 when he contracted pneumonia as a colonel and consulting physician to the British Armies in France. His poem continues to touch the hearts of those who read it as a poignant and moving tribute to the men who fought. Lest we forget.